Braun Combi 51B Foil and Cutter Replacement pack black. For WaterFlex. I haven’t had any issues with my braun water flex. Had 18 months and am looking to replace block and foil. Bought unit for a great price, was afraid it was going to be poor quality but have been impressed thus far. I use this razor to start and then finish with a standard 3 blade manual razor. Only way to get a clean shave that lasts for awhile. The same as Jaap' review. Any S5 foil can not last 2 months.. Thinking to try and other model or simple give up on the Brown 5 shavers. It is interesting that the company tolerates this at all. Purchased all foil and cutter replacements at Wallmart stores. More than 55 CA dollars. 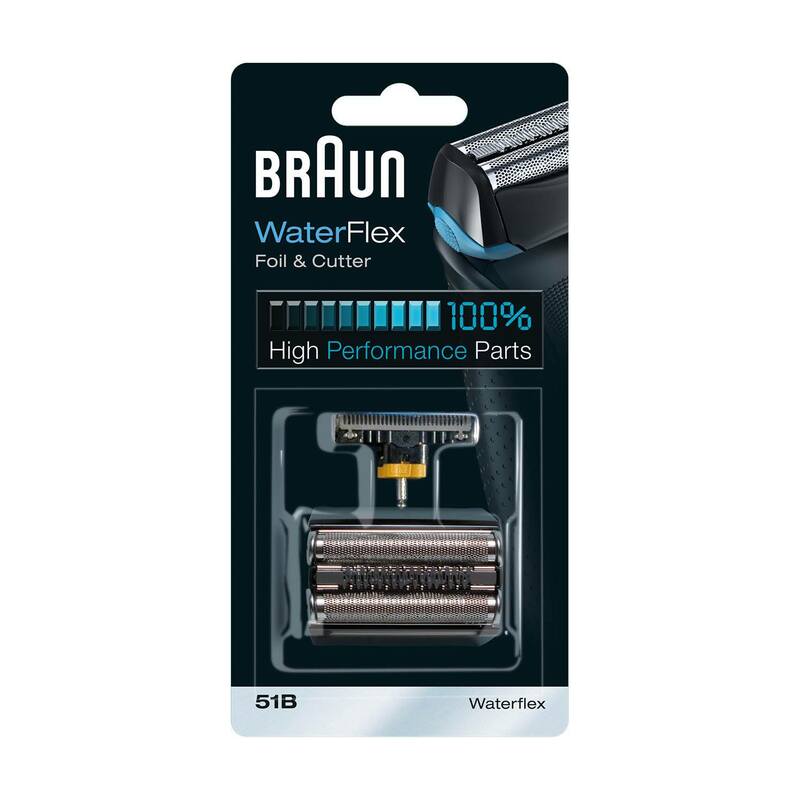 "Braun recommends changing your shaver’s foil & cutter block every 18 months" - that's great, but I have yet to use a foil & cutter block that lasts me longer than 3-4 months. I've bought a new Braun WaterFlex razor about 11 months ago and have worn out 4 blocks since. The foil will typically tear at one of the sides, near the end of the foil. The resulting projecting metal is very sharp and can give you some nasty (but superficial) cuts. As my beard is not extremely heavy and I only shave half my face - as I have a goatee and sideburns, I don't think the failure are due to overuse. And as the foils keep breaking in the same spot for all of the blocks, I think it's simply a design flaw. Can't do better than 2/5, sorry. And that's from a life-long Braun shaver user. Sadly, this has been the worst Braun shaver I've owned in my life. How hard do you have to press into your face to shave a single hair? I've had the water flex for a while now and only use it to finish where I missed with wet shaving with a track II blade. I'm hoping a just got a dud original head which doesn't do much and I have to press very hard against my face. I've had cheap Sears electric razor that do a better job. This Braun is disapointing as it doesn't do much. Im considering trying a replacement head , to see if that the problem.